The 2016 Honda HR-V crossover has only been available in the U.S. for half of May, and in that time has already sold more units than the 2015 Fit did in the entire month. The 6,381 HR-Vs was more than any competitor in the small crossover segment, Honda Executive Vice President John Mendel told WardsAuto, though the news site argued that the Subaru XV Crosstrek (7,876 sold) should be part of that segment too. But then again, the Crosstrek had half a month longer. Honda plans to produce about 70,000 HR-Vs in the car’s debut model year. For body shops, the real figure that matters is this: The “entry crossover” is 27 percent steel between 780 and 1,500 megapascals. 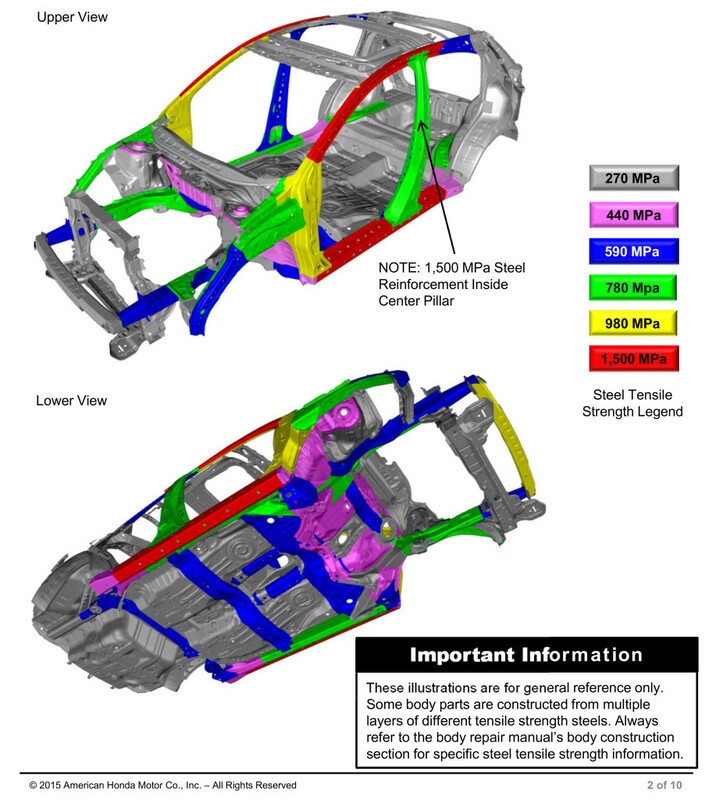 That 780-1,500 MPa ultra-high-strength steel is around three and five times as strong as the 270 MPa mild steel in the car. The HR-V uses less 1,500 MPa steel than Honda vehicles like the recently announced 2016 Pilot, which has an entire door ring of that grade. However, the existence of the gigapascal-level steel and the 980 MPa ultra-high-strength steel in the crossover still demands repairers adhere to strict guidelines, as do the HR-Vs 590-780 MPa advanced high-strength steels. Ultra-high-strength steels on the HR-V include the A-pillars and roof rails, the B-pillar, sills/rockers and in parts of the front frame rails. Never heat a part being straightened. Never section anything stronger than 780 MPa (and check with the manual on if you can even section something weaker than that). Don’t MAG-weld any of the 1,500 MPa steel, and don’t use a MAG plug weld on 980 MPa steel. If you are MAG-welding, use a wire with a tensile strength at least equal to whatever steel you’re welding. For 590 MPa steel, you’ve got to use 86 ksi wire (which is 8,600 psi) or greater. Honda points out that common ER70S-6 MIG wire is only 70 ksi, which means you can only use it up to 483 MPa steel. MIG welding or brazing must use 100 percent argon shielding gas. MAG welding should be done with 80 percent argon to 20 percent carbon dioxide. Honda also observed that the HR-V, like the Pilot, uses the company’s Advanced Compatibility Engineering body to keep everyone inside safer during frontal crashes. This could mean that repair mistakes could throw the system off, so check with Honda to ensure you and your co-workers know what to do and have the training and equipment to do it properly. “ACE utilizes a network of connected structural elements – with extensive use of high-tensile strength steel – to distribute crash energy more evenly throughout the front of the vehicle,” Nucci wrote. “This enhanced frontal crash energy management helps to reduce the forces transferred to the passenger compartment and can help to more evenly disperse the forces transferred to other vehicles in a crash. 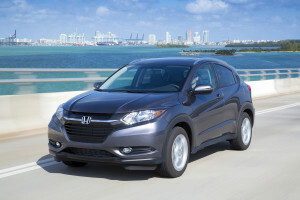 It is expected to help the HR-V achieve top-class crash test ratings. The ACE body structure also helps mitigate the potential for under-ride or over-ride situations that can happen during head-on or offset frontal impacts between vehicles of varying size and ride height.